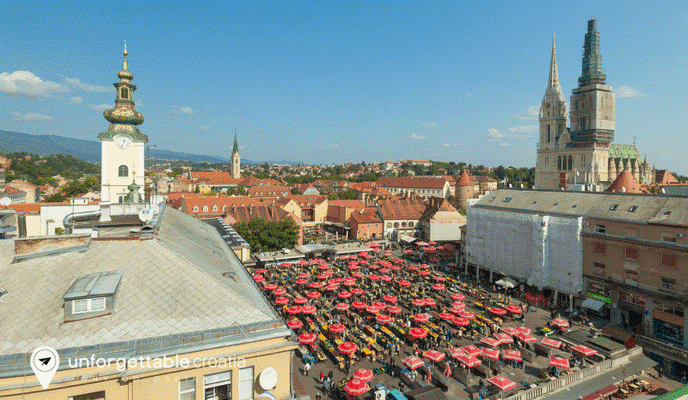 Behind the town’s main square in Gornji Grad, in the Medveščak city district, you will discover a magical maze of indoor, open-air and upper level markets that highlight the best aromas and flavours in Croatia. For an unforgettable food experience, take a wander around this magical market. Even if you don’t plan on buying anything, Dolac Market is a great place to check out if you want to experience authentic Croatia. After all, this is where the locals buy and sell their homegrown produce. The market has a vibrant atmosphere and a laidback vibe. If you’re visiting on Saturday, the busiest day, expect it to get a little noisy and crazy. 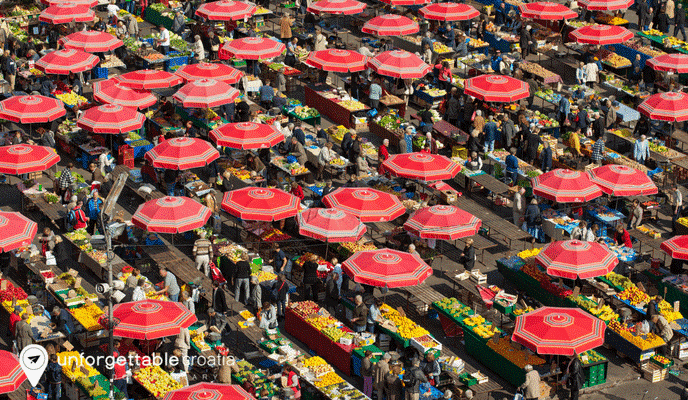 As the most visited farmers market in Zagreb, everyone will be out shopping for their groceries at the weekend. Dolac Market is the largest green market in Zagreb and comprises of four distinct areas. Splavnica is the flower market and is located in a side street adjacent to the main market square. Fresh flowers are displayed in double rows of low stands for maximum viewing and choosing potential. You will also encounter a few elderly ladies walking around selling small bouquets of fragrant wild flowers. The main indoor market building is on street level. Here you will find butchers, fresh pasta vendors, bakers, and cheese sellers vying for your attention. The market’s dairy section is where you will find ladies selling homemade corn bread that baked freshly each morning. In the first-floor indoor market, feast your eyes on colourful vegetables, fresh fruits, dried fruits and nuts. Eggs and honey are also available here. All of the produce is locally grown. Many vendors bring their produce from nearby villages, although some even travel from the Zadar region to sell their goods at Dolac Market. On the upper level is the covered fish market. The fish that is sold here couldn’t be fresher unless you hired a boat and went out to sea to catch it yourself. Also on the upper level of the market is a collection of stalls selling local handicrafts, clothes, shoes and other household items. If you want to take a break from gazing at the vast variety of produce choices, you can stop for a coffee or a beer at one of the cafes or bars situated in the upper level market. Once you’ve shopped till you dropped in Dolac Market you can easily navigate your way out. Exit from the upper level and you will find yourself facing the Cathedral. Stroll along passed the handicraft stands until you reach the main street. 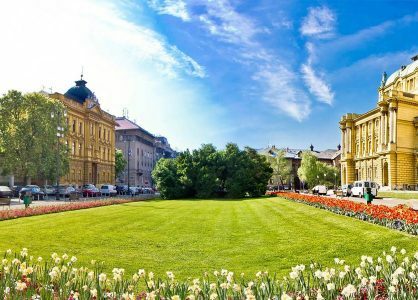 You can visit St. Catherine’s church, or continue on towards Tkalciceva Street, where you will discover the hippest shops, bars and cafes in Zagreb. Give our experts a call today on 020 8004 2345. You can also visit the Croatian capital on a 10-Night Zagreb, Plitvice & Split Cruise.